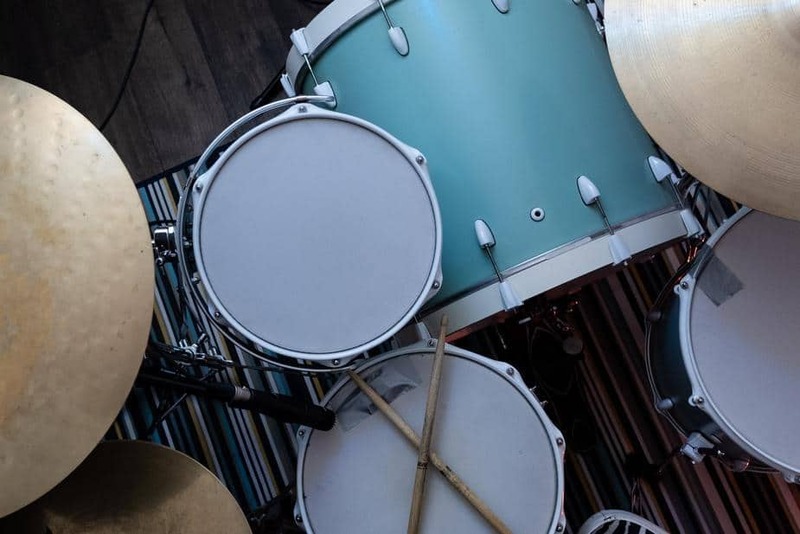 Drum kits are loud and noisy and not the easiest of instruments to set up with microphones for recording. While there are many microphones on the market some are better aimed towards those who play the drums and wish to record them than others. However, not all microphones make the best overhead drum mics so to narrow them down to make choosing easier we have picked out and reviewed 6 of the best you can get. The dynamic microphone is a great choice when wanting to use it with a drum kit. Without going into too technical details it works by electromagnetic induction. Microphones such as these are generally robust and have a design that is simple, making them a good choice for drummers. 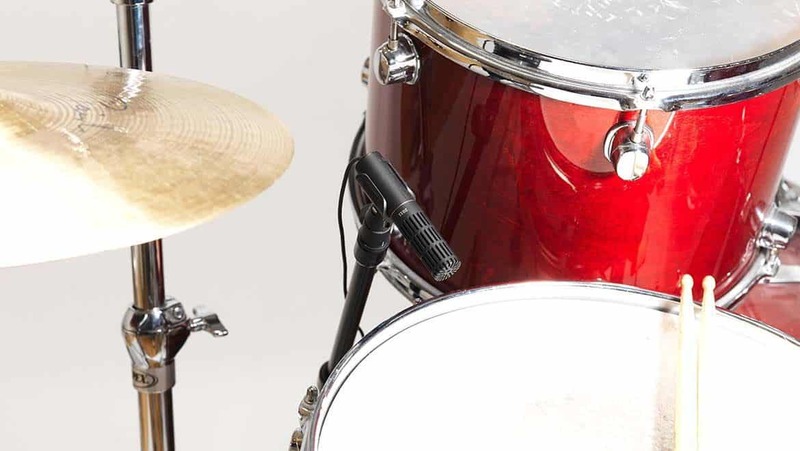 The condenser microphone is one of the most popular choices of mic for drummers but both the dynamic and condenser can be used together to excellent effect. This type of mic is perfect for overhead use, while the dynamic is best for a close mic. The condenser microphone works on the electrostatic principle. This type of microphone is usually more sensitive than the dynamic. The ribbon microphone is an electromagnetic induction mic that can be used but is not the most suitable choice for use with a drum kit as they tend to be fragile as the ribbon name might suggest. To narrow down the choices for reviewing and make things easier when it comes to choosing an all-round excellent microphone we stuck with the condenser microphones. Why Choose an Overhead Microphone? Just as there are different types of microphones there are different placements for microphones. For instance, you might have them overhead or you could have separate microphones on stands on the floor close to the cymbals and drums. However, if you are limited in regards to recording your drums you might want to go for the overhead microphones. Overhead microphones are the best to capture an overall balanced stereo image of the drums. In this case, these microphones come into their own, either large or small ones and there are many fantastic options, designs, and styles offered by some of the most well-known brand names in music. The most suitable type is a matched pair of microphones for stereo recording and these are purchased together. You can, of course, purchase two single microphones but they will vary more greatly in decibels than the matched pairs and it will generally work out more expensive purchasing them separately. The overhead mics are a very good choice if you have just two channels on your mixer. You might also wish to use a microphone for the kick drum, with it being one of the most crucial parts of your drum kit. In this case, you should look for a mic that has a frequency response that has been tailored to the lower end. Consideration needs to be given when choosing microphones for snare drums along with overhead mics. If you have the channels to be able to add in more microphones you might want to consider one that offers high max SPL with a tight cardioid pattern and of course, a microphone that is durable. When choosing cymbal microphones look for a cardioid small diaphragm condenser microphone as this will ensure that the microphone captures high-frequency details. The most apt drum microphone for you may to some extent depend on how you plan on using it, for instance, overhead, to the side or in front. It might be also dependent on whether you plan on using it live or you want to record on it in the studio. There are certain things to keep in mind when choosing a drum mic. Above all else, microphones used around drums should be rugged and designed to withstand the occasional hit from your drumstick and being carried around if attending gigs. Microphones often come with a carry case but not always, so check that. 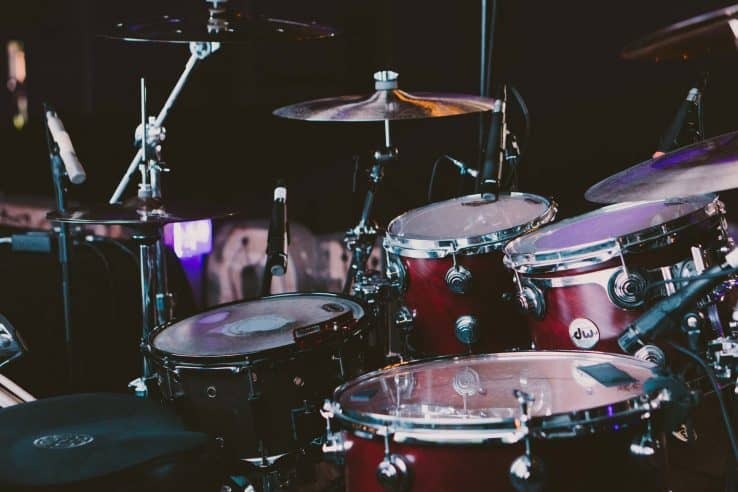 Another factor that will go towards choosing the most suitable microphone for your drum kit is the genre of music you play. For instance, if your forte is jazz music you may be better off choosing good overhead mics and placing them high up, along with using the snare and kick microphones. Setting up microphones if playing heavy rock music would be different, with overhead microphones being enough to do a great job. One thing to consider is that when playing live with others in a band the overhead microphone may pick up the other instruments around you if it is placed too high. In the recording studio, this is generally not an issue. You might not realize but a single pair of multi-pattern microphones offers diverse choices for mics for drums that come with different characteristics. You might ask how the same set of two microphones can offer such diversity, but they can, it’s all down to the placement of the microphones, so as mentioned above take some time when placing the microphones and experiment with recording noticing the differences. So without any further ado let’s start with the reviews of some of the top drum mics you can buy. The first on our list is the Samson SAM C02PR Pencil Condenser Microphones from Samson Technologies. This pair of microphones comes in a rugged case for protection when traveling and offer performance that is reliable. They are extremely sensitive picking up all nuances during your drum performance and a fantastic choice for in the studio. Samson is a name that is recognized for producing high-quality audio products and has been around since 1980, classed as the pioneer of wireless microphone technology. The Samson SAM C02PR Pencil Microphones offers superb high-quality audio performance and are ideal for those who want to place microphones in more than one position. The microphones have a linear frequency response which offers reproduction that is superior, making them some of the best drum mics for recording, also being able to withstand high sound pressure levels. The microphones come complete with a brass case and a foam windscreen to reduce popping. They are ideal to be used as overhead microphones capturing detailed sound and they have received countless other positive reviews. Is The Samson SAM C02PR Pencil Condenser Microphone Suitable For You? These budget microphones are suited for beginners in live and studio environments. As with anything, there are pros and cons but with the Samson SAM C02PR Pencil Condenser Microphones there are more pros than there are cons, they are. The Samson SAM C02PR Pencil Microphones do offer excellent value for money. For the price tag you do get two microphones, a carry case, windscreens, and shock mounts, however, they are aimed more at the beginner and might soon be outgrown. On saying this they are decent quality for the price tag, they do offer great quality sound and they are perfect as overhead mics for drum kits. If you are looking to purchase your first microphones for your drum kit you might want to check them out. The Rode M5MP Compact ½ inch Microphones are made by Rode in Australia. They are cardioid condenser microphones designed with an all-metal body. These microphones are a high-quality pencil style, following on in the footsteps of the NT5 award-winning microphone from the company and the result of many years of experience. They are perfect for overhead drum mics in the studio and in live environments. So is the Rode M5MP Compact ½” Condenser Microphones worth buying and if so why? These are compact microphones that can be used singularly or together and offer a full frequency response with low noise and are perfectly matched together. Rode offers a premium foiled certificate for authentication and they come with the proprietary ceramic coating that Rode is known for. The microphones look superb with their matt black finish and they are supplied with stand mounts and windshields. Anyone who wants sleek looking compact microphones of high quality that are backed with a warranty that can be extended to 10 years simply by registering the product might give consideration to them. Is The Rode M5MP Compact 1/2″ Condenser Microphones Suitable For You? The Rode M5MP Compact ½” Microphones M5MP are suitable for overhead in the studio and live sound environments, for any level. So what are the good and bad points of the Rode M5MP Compact ½” Microphones? The Rode M5MP Compact ½” Condenser Microphones M5MP are among some of the most affordable microphones offered by the company, with some people saying you only get what you pay for. The microphones do seem to be good quality and they do have a nice matte black finish to them and are a matched pair. Being at the lower end of the price scale they are worth checking out as overhead mics for drums and anyone wondering they may not be able to stand the test of time should not worry as Rode offer a 10-year guarantee when registering the product with them. The Rode NT5MP Condenser Microphones are mid-priced microphones from the company but are they worth it? These are a matched pair of microphones that work extremely well as overhead microphones for drum kits, offering awesome sound. The microphones are “hot plugging/unplugging” resistant and represent great value for the price tag. The microphones are sturdy and come in a box that holds everything where it should, which is perfect for when traveling with the microphones. The Rode NT5MP Condenser Microphones do not take a lot of fiddling around with in regards to placement; they pick up sound good wherever they are placed overhead. Here are a number of the features that stand out on the Rode NT5MP Condenser Microphones. The Rode NT5MP Condenser Microphones are magnificent looking finished in durable satin-nickel. They are small diaphragm cardioid condenser mics aimed at recording drums overhead and while they are compact they are well-built with a cardioid pickup pattern that is tight. A single microphone can be used but they are a certified matched pair. The microphones come in a sturdy padded case with foam insert, two stand mounts, a zip pouch, and windshield and are backed up with a 10-year warranty. Is The Rode NT5 MP Condenser Microphones for Drum Set Suitable For You? The Rode NT5MP may be more suited to the intermediate or professional due to the price tag. Now we will proceed to take a look at the pros and cons of the Rode NT5MP Condenser Microphones. The Rode NT5MP Condenser Microphones for Drum Set are a great set of matched stereo drum microphones and they do seem to provide impressive results. The overall sound recording is rich, although some owners have complained about sibilance and popping, which does disappear. They are a great choice for those who want to record drums overhead, capturing the sound of cymbals extremely well. While they do come with a price tag at the top end, they are well made and high quality and they are backed up with a warranty of 10 years. However, if you go ahead and purchase them, register both microphones as they do have separate serial numbers. The AKG 3185X00110 Matched Pair Stereo Set Professional Large Diaphragm Condenser Microphones look stunning but come with a price tag that will have you seriously thinking twice if you are anything but a professional. They are said to offer performance that is outstanding thanks to the microphones capturing sound by way of a combination of utilizing the C414 dual-capsule system and AKG Back-Plate tech. However, are they worth the outlay? Let’s take a look. First, we will check out some of the features that stand out on the AKG 3185X00110 Microphones. The AKG 3185X00110 Matched Pair Stereo Professional Condenser Microphones are premium grade having been designed for numerous recording applications making them perfect for overhead drum mics. They are impressive looking with a high-end one-inch capsule. The microphones have a superb natural tone with highs that sparkle and low-end that is defined. The AKG 3185X00110 comes with a switchable 20Db attenuation pad, which assists in recording loud sources distortion free. Now onto the tech specs for the AKG 3185X00110 Condenser Microphones. Is The AKG 3185X00110 Matched Pair Stereo Set Professional Large Diaphragm Condenser Microphones Suitable For You? As the name suggests these microphones are aimed at the professional. Here we dig down into the pros and cons of the AKG 3185X00110 Matched Pair Large Diaphragm Condenser Microphones. Anyone looking for high-quality professional microphones to use with their drums might want to check out the AKG 3185X00110Matched Pair Stereo Set Professional Large Diaphragm Condenser Microphones as you do get a lot for the money. AKG have based the microphones on their higher end mics in the C414 range. The microphones offer a sleek look thanks to the die-cast metal body complete with a finish that is both scratch and shock resistant. The sound is big, clear and full with the cymbals sounding crisp and the toms warm and round. The microphones are protected in a rugged carry case for taking out on the road and they come complete with universal shock mounts. While they make an excellent choice for overhead drum microphones, they are versatile, making them excellent value for money. The Rode NT1KIT Condenser Microphone Cardioid package is among the latest in the range offered by Rode. It has been based on the NT1-A with Rode going back to the drawing board to redesign it from scratch. The microphone package is complete with a double-Lyre suspension system on the shock mount that is unique, enhancing the vibration cancellation system. Here are the features that stand out on the Rode NT1KIT Condenser Microphone Cardioid package. The Rode NT1KIT Condenser Microphone Cardioid package offers detailed crisp sound with lots of warm low-end body. It is packed with the latest tech from Rode and they have included a professional level shock mount, the Rode SMR, along with pop filter in the package. The pop filter is made entirely from metal, giving it a great look along with being removable and washable, designed to last. The capsule is a brand new design, being a notable example of the artistic design along with manufacturing techniques of Rode, offering a superb sound signature and low noise. Now onto the tech specs of the Rode NT1KIT Condenser Microphone Cardioid package. Is The Rode NT1KIT Condenser Microphone Cardioid Suitable For You? Being in the mid-range price the Rode NT1KIT is suitable for all levels. So what are the pros and cons to purchasing the Rode NT1KIT? For the price, the Rode NT1KIT Condenser Microphone Cardioid is a great buy. It does come with a custom pop filter, shock mount, and dust cover, but it lacks a sturdy case, which competitors offer with similarly priced microphones. It does offer a sound that is crisp but it may be more suited to those starting out than the professional. However, on saying this it is worth taking a look at and comparing owing to the superb quality of the microphone and its great looks. On the downside, if you want to take the microphone out on the road with you, you will have to pay out extra for a sturdy case to keep it safe. The Shure KSM137/SL Microphones bundle consists of a pair of stereo cardioid microphones complete with foam windscreens, adapter and carrying case. The microphone is an end-address condenser microphone with a cardioid polar pattern great for use in the studio, but performing equally well in live surroundings. This is a fantastic choice of microphone for overhead miking of drums. Is the Shure KSM137/SL Stereo Pair headphones bundle worth handing over your hard earned cash for? Here are some of the reasons why you might wish to consider them. The KSM137/SL microphones offer reproduction of low-sound frequency that is exceptional and they are able to withstand levels of extreme sound pressure. While the microphones were specifically designed to be among the top drum mics for recording, bear in mind they are sturdy enough to be used in live environments and they come with a carrying case for added protection. They offer a warm tone with a response that is crisp, with a great range of frequencies. Let’s check out the tech specs on the Shure KSM137/SL Stereo Microphones. Is The Shure KSM137/SL Stereo Pair with Foam Windscreens, A27M Stereo Microphone Adapter and Carrying Case Suitable For You? The Shure KSM137/SL is a fantastic choice for all levels. Now we will concentrate on the good points and bad points of the Shure KSM137/SL. The Shure KSM137/SL Stereo Pair with Foam Windscreens adapter and carrying case is fantastic value for money, coming from a brand name that has stood the test of time in relation to music. The microphones are constructed from premium electronic components as you would expect from the brand, with no crossover distortion, while intermodulation and harmonic distortion is minimal. The switchable 15 dB pad deals with high sound pressure levels while the 3 position switchable pad handles high sound pressure levels. The low-frequency filter is put in place to help keep background noise down to a minimum along with counteracting against proximity effects. Bundled with the sturdy carrying case, foam windshields and microphone adapter it comes it is value for money package. The above are our choices of the best overhead drum mics on the market today. 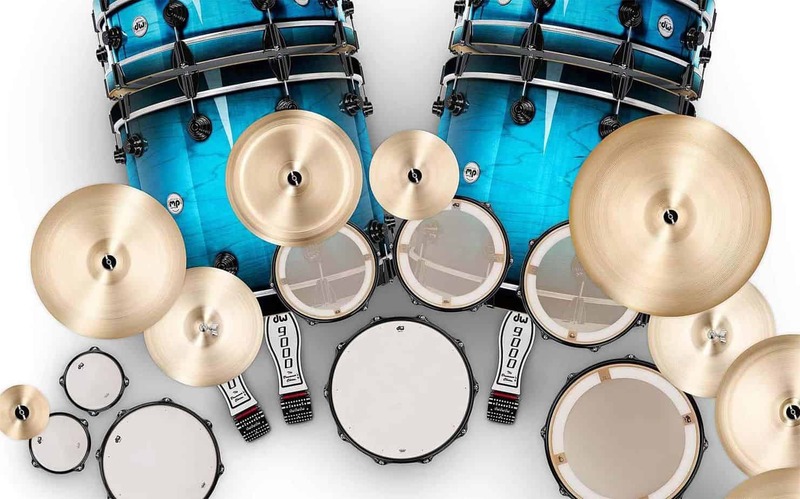 Of course, this list is by no means the only choices out there, but the microphones and brands we have chosen are all worth taking a look at, based on what they offer along with being value for money and they all work well as overheads for drums.